iJoy Twist Ride Exercise balance trainer by Human Touch. Our Price - $599 Includes Ground Shipping! 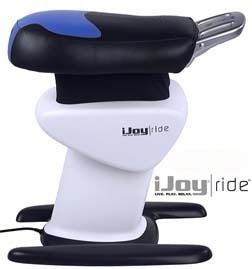 The iJoy™ Ride is a unique and exciting way to work out! It has been engineered to work your core muscles by challenging your balance. It does all the work-you just sit back, keep your balance, and have fun! 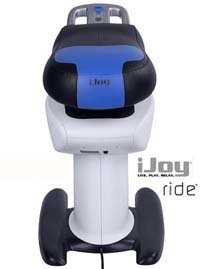 The iJoy™ Ride's three-axis motion challenges three different muscle groups. Test your skills by varying the speed of the iJoy™ Ride or choose the auto-program and let the iJoy™ Ride take control; dishing out a combination of all four speeds. You really can't go wrong working out on the iJoy™ Ride. As you work to keep your balance, you?re working your muscles. So, make it fun! Express yourself! 3. a yawing motion for working the lumbar muscles. New iJoy Twist - Our Price - $699 Includes Ground Shipping! New iJoy Twist adds a new twisting motion for even better core muscle strengthing and exercise. 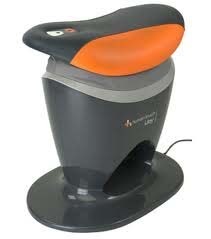 Great Balance Trainer! Product Measurement in inches: 26" x 17" x 27.5"
*WARRANTY INFORMATION: New iJoy Boards, iJoy Rides and iJoy Twists include a manufacturer's one-year limited warranty against mechanical defects (cosmetics are not covered). Parts are covered for one year from the original date of purchase. Parts and Labor are covered for 90 days from the date of purchase. Refurbished iJoy Boards, iJoy Rides and iJoy Twists have a six month limited warranty for parts and a manufacturer's 30 day parts and labor coverage. The warranty is not valid if the product has been misused or damaged in any way that is beyond the control of the manufacturer. The product (or parts) may need to be returned to the manufacturer for service by technicians.